Cucumber, cantaloupe, and watermelon growers in Kentucky should have their eye out for anthracnose this week. Anthracnose is especially common on melons during this time in the growing season in Kentucky, and preventative practices are essential to reducing disease incidence. Prevention, early identification, and management will help reduce plant losses. Here are the symptoms to look for, preventative tactics, and brief suggestions on how to treat crops once disease is confirmed. 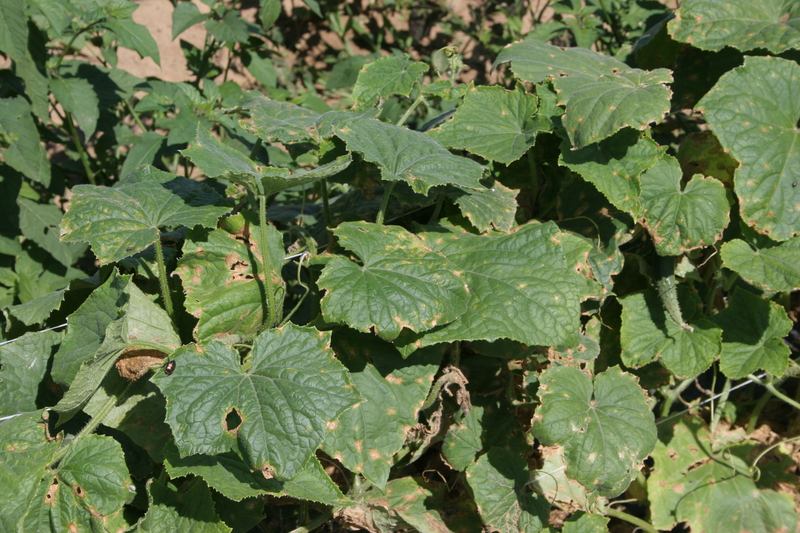 Cucurbit anthracnose is caused by the fungal pathogen Colletotrichum orbiculare. This pathogen can infect cucumber, gourds, squash, and pumpkin, but is most common on cantaloupe and watermelon. This pathogen may originate from infested seed, transplants, weeds, or persist in association with crop debris from a previous year. Fungal spores are spread via splashing water, such as rain or irrigation. Anthracnose is favored by rain, warm temperatures, and high humidity. Once established, the disease can spread rapidly in dense plantings, and in severe cases, plants collapse. Anthracnose begins as a foliar disease; however, all above ground plant parts may become infected. The first symptoms appear as small, circular lesions on leaves, particularly in the inner parts of the canopy. Over time, lesions enlarge to become large tan to brown spots (Figure 1). These spots may coalesce, resulting in extensive blight. Stem lesions are tan-brown, sunken, and may be elongated. Lesions may also develop on maturing fruit and first appear as small, circular, sunken areas. Throughout fruit development, lesions expand to become the size of a quarter or larger (Figure 2). 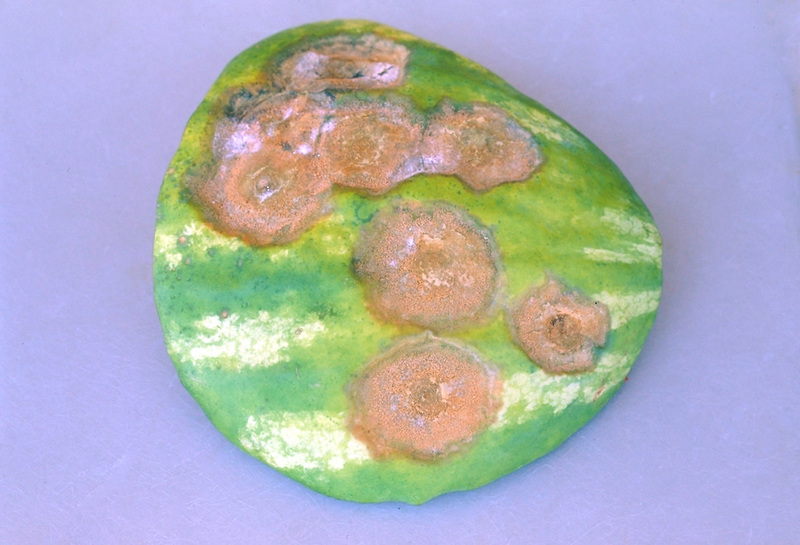 Under humid conditions, fruit lesions may appear blackened and masses of salmon-pink spores may be observed. Symptoms may appear slightly different on watermelon. Leaf lesions tend to be smaller, irregularly shaped and darker in color. On fruit, lesions may be cracked and irregularly shaped. Select pathogen-free seed or varieties with resistance to anthracnose. Rotate fields out of cucurbits for at least two growing seasons. Remove plant debris and weeds from the growing area. Avoid overhead watering to reduce leaf wetness. Use recommended plant spacing to facilitate air movement and leaf drying. Begin a protectant spray program utilizing chlorothalonil or mancozeb no later than vine touch. Sprays may be applied every 7 to 10 days, or ideally with the help of MELCAST, a melon disease forecasting system. Include copper if bacterial disease becomes an issue. Within 4 weeks of transplant (earlier if symptoms develop), introduce a systemic fungicide into the program. Systemic fungicides with good activity for anthracnose on cucurbits include those in FRAC groups 1, 3, 7, and 11, as well as pre-mixes including these groups. As always, all label recommendations must be followed when applying chemicals to crops. In particular, pay close attention to pre-harvest intervals. Also, some chemicals may be phytotoxic to melons under certain conditions; carefully read product labels prior to application.